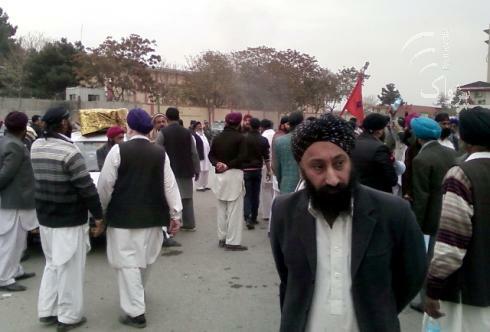 KABUL ( PAN ): Members of the minority Sikh community rallied against residents of the Qalacha neighbourhood of Kabul for opposing the cremation of their relatives’ bodies. Dozens of protestors in Pashtunistan Ward also accused the Afghan police and army of preventing them from burning their dead in line with their religious tradition.Afghan News they wanted to burn their dead relatives in Qalacha. They also carried a woman’s body in a vehicle and sought a place for cremating it. One protestor, Raji Singh Dilnawaz, told Pajhwok nt to drive Sikhs and Hindus from the country if it could not resolve the problem. As the protestors wept and tossed bottles in the air, one of them, Darwand Singh, blamed Qalacha residents for opposing the cremation of Sikhs’ bodies in the area. “Afghan police and soldiers slapped me and said we will never be allowed to follow our tradition,” warning of continuing their protest and blocking the road. According to another demonstrator, Avatar Singh, the Ministry of Religious Affairs has failed to keep a 2003 promise regarding the creation of a crematorium. The problem needed to be addressed on a priority basis, he said. A Sikh member of the Senate, Anar Kali Honaryar, also participated in the protest. She explained residents, not security forces, had prevented the cremation ceremony in Qalacha. The lawmaker claimed winning a promise from the security personnel regarding an early solution to the problem. She demanded the arrest of the elements stopping Hindus from burning their dead relatives.